I'm not sure if you see it but when I look at this cake I see something eerily beautiful. Yes, it's an enticing cake but it gives off a creepy vibe. It reminds me of something a serial killer would serve as a final dish. Too dark too soon? Haha! That's me at times. Not a lot of people know this about me but I love watching movies and tv series in the gothic genre. Although I don't dress the part, I enjoy emerging myself in these types of flicks. When I was 11 years old and the movie Interview with the Vampire had just come out, I knew I had to rent that film (and not just because Brad Pitt, Christian Slater AND Tom Cruise were in it). Call me weird (but please call me cool!!!) but I seek out to terrify myself at times. Now, how can I relate this peek inside my life and interests to this scrumptious dessert? October is here and we're gearing up for Halloween!!! I love Halloween! I love getting my son in a cool costume, the food and the license to be morbid...in creating dishes. This is post one of my Halloween recipes all this month of October! Grease 2 round 9-inch baking pans and line the bottom with parchment paper. Transfer bowl to electric mixer fitted with the whisk attachment, and beat, starting on low speed, gradually increasing to high, until stiff, glossy peaks form, 5 to 7 minutes. Add vanilla, and mix until combined. Fold ground walnuts carefully into the meringue mixture. Divide walnut-meringue mixture onto the 2 round baking pans. Let cool and remove from pan running a knife through the sides. Using a mixer, whip the cream until soft peaks and gradually add the powdered sugar until stiff peaks, fold in chopped chocolate leaving some for garnish. Layer whipped cream onto one meringue cake. 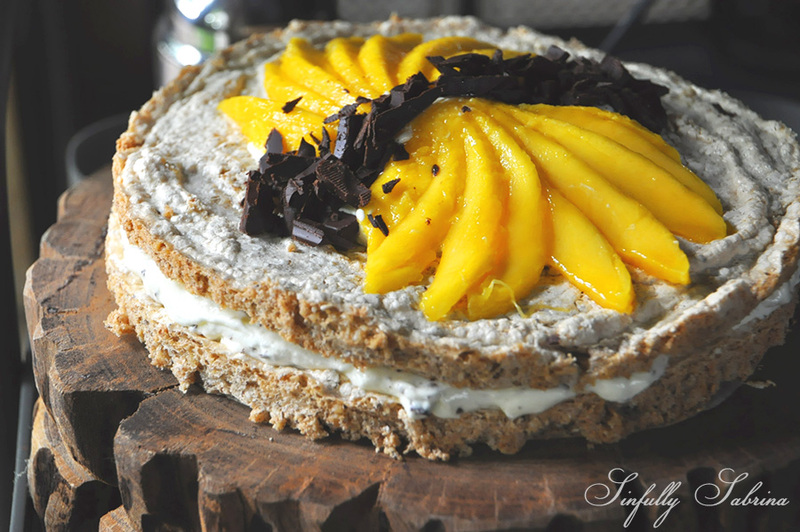 For one ripe mango, cut into cubes and top onto whipped cream layer. Top the other walnut meringue cake. For the other ripe mango, peel 2 cheeks, slice into thin strips but not cutting all the way through and fan it out. Top the fanned mango and the remaining chopped chocolate to garnish.